Sanjay threw the cigarette stub down and stomped upon it. It was his third cigarette and he was no closer to calming down than he was an hour earlier. Though he realized that the cigarettes weren’t helping, he couldn’t stop himself from lighting another one. It’s all so absurd and meaningless, he said to himself, as he walked up to the parapet wall, and glanced down. This was the terrace of a seventeen-floor building and if he were to fall down from here, there was no way he could survive. He would die, and that would end this pain caused by his repeated failures. This was his third year without a promotion, and what made the pain worse was the fact that every year the person who was promoted to the position of Project Manager was junior to him. The same grating story had repeated itself year after year, and for some reason this year Sanjay’s patience had reached the end of its tether. He wanted to quit. “Sulking again?” Sanjay’s dark reverie was broken. Riya, the new girl who he shared his cubicle with, stood behind him craning her neck to gauge the fall that he was contemplating just a few minutes ago. “He’d be dead,” Sanjay couldn’t stop his thoughts from bursting forth. “Dead? He’d be lucky if he died. Imagine what’d happen if he didn’t die? I shudder to think about it,” said Riya, with an imitation of a shudder. Sanjay turned to look at Riya. She was a Telugu girl, pretty in a different way – she was a doe-eyed dusky beauty with a sweet melodious voice. She looked happy without a worry to wrinkle her smooth forehead, and she indeed looked pretty in the burgundy turtleneck that she was wearing. For a minute, Sanjay forgot his pain and the dark-thoughts that hadn’t allowed him a moment’s rest since morning. He smiled at her, and thought that there indeed was a possibility that if someone fell from the terrace, he’d end up a crumpled heap of twisted limbs. This surely wasn’t something that he had accounted for. After the momentary pause, his dark thoughts assaulted him again. Lisa, Riya’s predecessor, was the one who had been promoted to the position that he’d been hoping to get this year. Riya could end up being promoted next year, while he who had been sloughing his… off all these years would continue to be the content writer that he was. He wouldn’t climb the proverbial hierarchical ladder because he didn’t have the “complete picture.” He had always dreamed of becoming a Project Manager – someone who’d have the whole team working under his supervision. He had some fantastic ideas on how he could improve the efficiency of the development process…but someone had to give him a chance. He had even applied to other organizations but despite working as an instructional designer for 3 years, he couldn’t move up – all because…he didn’t know the ID principles…Oh! He knew them all right – Bloom’s Taxonomy and its six levels, the ADDIE model, and the ARCS model – but when he spoke about them in his interviews, even he felt that he wasn’t able to connect them to his work…and then there were those other things…Gagne’s, Dale’s…whatever! Why did they have to come up with those concepts in the first place? Did someone somewhere really use them? “What are you thinking?” Riya looked at him searchingly. “You mean to say that you have enrolled yourself into one of those courses that teach you some psychological nonsense, and give you a certificate in instructional design?” Sanjay could hardly keep the sarcastic edge out of his voice. They had both tried to persuade him to take the course too, but he had shrugged off their suggestion. He had told them that he didn’t need a certificate, but then it wasn’t only about the certificate – was it? Actually, it wasn’t at all about the certificate. 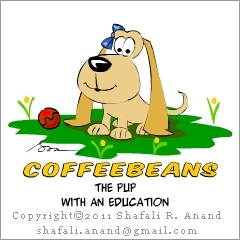 It was about the Customer Satisfaction Ratings on their courses that got them their promotions. And yes, those client-calls too. While Sanjay often fumbled when he had to provide reasons for his instructional decisions, Manoj, Reeti, and Lisa would breeze through those calls – talking about some ID principle or the other that they had used in designing their courses. He was stuck with the one and only Bloom’s Taxonomy! Had he been in denial? Sanjay looked at Riya and thought how well she had understood his plight. Could it be that she could see through the haze of his pain, because she was taking that ID course? Nah! That’d you’d call far-fetched. But at that moment, all he wanted was to return to his workstation and read about the IDCD course. Identify the primary components of motivation in Sanjay’s story. Isolate inspiration in this story. Sanjay had been bypassed for promotion for three consecutive years. Why did he decide to take an ID course now? Note: This post links to the IDCD course that I conduct. If this story resembles yours, please visit the page, reflect upon how it could be of help to you, and then either write to me or call me. 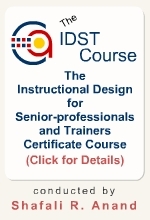 If you have substantial experience in a content-related field or you are a trainer you should visit the IDST course page. I am not adding my contact information here because I don’t want you to act on impulse, but you’ll find it at the bottom of the course pages.